Exotic sonic textures and chilled rhythms create a beatific Eastern backdrop for your power yoga session-or the festivities that follow. Crafted to flow with an upbeat mood, Yoga Mela lends a sensual vibe to any casual setting. This collection matches some of the most popular names in the "yoga beat" genre--including Prem Joshua, Ikarus and Karmix-with rising stars such as Suvarna, Toires and Aziza A. Master mixologist dj Cheb i Sabbah lends his magic hand to previously unreleased remixes by Deva Premal and Manish Vyas. Together, these groove savvy artists dish up an Oriental concoction of the freshest flavour. 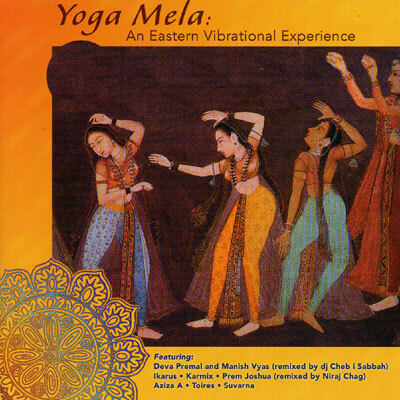 Evoking the worshipful, celebratory aura of Asian melas--or festivals--Yoga Mela invites you to immerse yourself in a relaxed aural experience that will move you at any volume. "